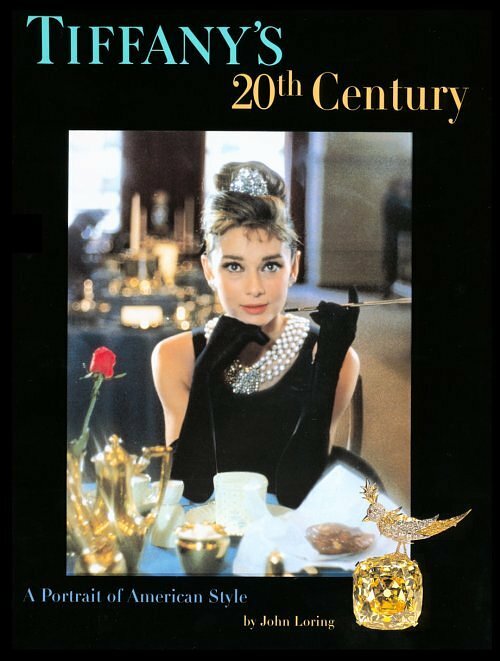 It is debatable whether Truman Capote's novel Breakfast at Tiffany's did much to increase the prestige of this famous New York jewelry store because long before 1958, the year of the book's publication, it had become a household name within the United States as well as abroad. Doubtless some people continue to inquire whether the store does serve breakfast to its clientelle, but of course what the delightfully-named heroine, Holly Golightly, sought was not refreshment of the stomach but of the spirit, which was supplied by the sight of the magnificent gems on display in the showcase. Founded by Charles Lewis Tiffany in 1837, Tiffany & Co. came to the fore among diamond merchants during the second half of the 1800s. During the political disturbances in Paris in 1848, which cumulated in the overthrough of King Louis Philippe, the firm bought a large quantity of jewels. At the sale of the French Crown Jewels in 1887, Tiffany's bought a great diamond necklace of Empress Eugénie, considered at the time to have been the finest single item to go on sale, four diamonds which may have been among the former Mazarins, as well as several other pieces. In the end, Tiffany's emerged as the largest buyer, with 24 of the total 69 lots. Between these two events in French history came the discovery of diamonds in South Africa. Tiffany's were active there too, buying a light-yellow cushion of 77 (old) carats cut from a rough stone weighing fractionally less than 125 (old) carats and another fine yellow gem weighing 51 and 7/8 (old) carats. Both of these two diamonds were among the first large stones to be cut in New York City. They were surpassed, however, by the famous gem named after its owners. 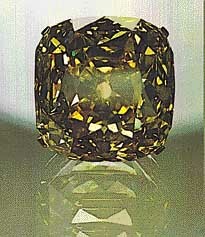 In the rough, the stone was a beautiful canary-yellow octahedron weighing 287.42 (metric) carats. It is believed that the Tiffany Yellow was found in either 1877 or 1878. The lack of exact information concerning the correct date of its discovery extends to its location as well; this has been variously described as the 'De Beers Mine' or the 'Kimberly Mine', 'the De Beers Mines' or 'the Kimberly Mines'. The finding of the Tiffany Yellow took place before accurate records of the discovery of large diamonds from South Africa were kept. However, the clue to its location has been supplied by one writer who has stated it was found in the mines of the French Company. This was the colloquial name for the Compagnie Français de Diamant du Cap, an important mining concern, the existence of which sparked off the most momentous financial struggle which the diamond industry has witnessed. Jean Schlumberger. The piece is the Tiffany Yellow's most well-known setting, and is the setting it remains in to this day. In the belief that the only solution to the problems posed by the inefficient and haphazard mining methods employed by the Kimberly deposits lay in the amalgamation of the multitude of claims into one unit, by 1887 Cecil Rhodes and his colleagues had succeeded in making the De Beers Mining Company, which was then headed by the flamboyant Barney Barnato. Born Barnett Isaacs in 1852, the son of a small shopkeeper off Petticoat Lane, one of the best-known streets in London's East End, Barnato was in every respect the complete antithesis of Rhodes. Barnato was an extrovert, imbued with Jewish-Cockney wit and humor. After leaving school at fourteen, he obtained a number of odd jobs including being a 'bouncer' at a public house and appearing on stage at a music hall. Several of his relatives left for South Africa after hearing of the discovery of diamonds there, so Barney eventually followed them. His only capital on arrival at the diamond fields consisted of a box of cigars - of doubtful quality - which he hoped to sell to the diggers. He became an itinerant buyer of diamonds, his genial personality proving a useful asset. In time, he bought for claims in the center of the Kimberly Mine and prospered so that he was able to form the Barnato Diamond Mining Company. Like Rhodes, Barnato kept on buying up claims. In 1885 Barnato merged his company with that of Baring-Gould's Kimberly Central Mining Company, thus giving him a strong hold in the Kimberly Mine as that of Rhodes in the De Beers Mine. Since his company was going so well, Barnato saw no reason at all why he should join any scheme of Rhodes for amalgamation. However, one obstacle lay in the path of the Kimberly Central, namely the Compagnie Français de Diamant du Cap. By virtue of its position within the Kimberly Mine and the policy it pursued, the French Company impeded any success of future operations by Barnato's company. Consequently Barnato made proposals to the French: but Rhodes had already done likewise and had succeeded in raising the finance necessary for the purchase of the French Company in Paris. Rhodes then laid a trap for his rival. He told Barnato that he could acquire the French Company if he wanted it and would not ask for cash in payment, only the equivalent of the price paid in Kimberly Central's recently issued new shares. By this means Rhodes was able to secure a useful foothold in the form of one-fifth of Kimberly Central's issued capital; all the time this had been his real objective, not the control of the French Company. Barnato acquiesced in his plan, falling right into the trap Rhodes had set for him. The stage was now set for a titanic battle for the remainder of the Kimberly Central's issued capital. Both Rhodes and Barnato bought recklessly, and at a time when the price of diamonds barely covered the cost of production, the company's shares soared from £14 to £49 within a few months. Eventually Rhodes and his associates could claim to own three-fifths of Kimberly Central's issued capital and Barnato realized he had been beaten. He surrendered in March of 1888, accepting the terms which gave Rhodes the control he had sought. On March 12th, De Beers Consolidated Mines Limited was formerly incorporated. The new company took over assets which represented the whole of the De Beers Mine, three-quarters of the Kimberly Mine and a controlling interest in the Bultfontein and Dutoitspan Mines. Cecil Rhodes and Barney Barnato were appointed among the company's first Life Governors. Sine if the Kimberly Central's shareholders, however, disapproved of Barnato selling out to Cecil Rhodes and challenged the merger in the Courts. It was the judge who told them that if Barnato agreed to put Kimberly Central into voluntary liquidation, De Beers could simply purchase its assets. Accordingly this is what the company did: Rhodes wrote out a check for £5,338,650 for the assets of Kimberly Central, which, in those days, was the largest sum of money ever covered in a single check. Further evidence that the Tiffany Yellow Diamond must have originated in the claims of the historically important French Company is show by the fact that the gen was shipped to Paris. Experts there studied it for one year before it was cut under the supervision of the distinguished gemologist George F. Kunz in 1878. It yielded a cushion-cut brilliant of 128.54 (metric) carats, measuring 27 mm wide, 28.25 mm long and 22.2 mm deep. It was given a total of 90 facets: 48 on the pavilion, 40 on the crown, plus the table and culet. The extra facets were cut not to give the diamond more sparkle, rather to make it smolder as if it were lit by fire. The gem is high in fluorescence and retains this rich color in artificial light, but is even more beautiful by day. The head of Tiffany's office in Paris, Mr. Gideon Reed, bought the Tiffany Yellow for $18,000, on behalf of the firm, whence it was imported into the United States in 1879. 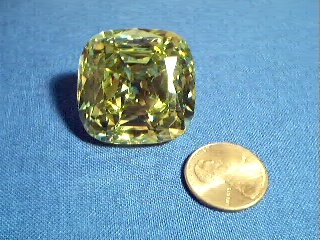 Initially, little publicity attended the diamond after its arrival there, a deliberate policy which has been ascribed by Charles Tiffany's fears that, as yellowish diamonds were being produced in South Africa in greater quantities than every before, this particular diamond might merely be one of many such stones. However, it is important to draw a distinction between light yellow and yellowish diamonds and those of the rare deeper canary yellow; the Tiffany Yellow remains one of the finest examples of the latter of the three. It was not long before the existence of the Tiffany Yellow did become widely known. In 1896 one of the triumvirate who ruled China, the Viceroy Li Hung-Chang - about whom President Grant is said to have remarked, 'There are three great men in the world, Gladstone, Bismarck and Chang, but the greatest of these is Chang' - visited New York. He announced that the one thing he wished to see was the Tiffany Yellow Diamond, a request that was duly met by the firm. 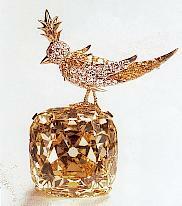 The Tiffany Yellow, set in Jean Schlumberger's "Bird on the Rock" brooch. Since being viewed by this distinguished visitor, the Tiffany Yellow has been seen by millions of others in almost seventy years of continuous display in Tiffany's store. It has also been shown at numerous exhibitions: they include the Chicago Columbian in 1893, the Pan-American in 1901, the Chicago Century of Progress in 1933-34 and the New York World's Fair in 1939. The first occasion on which the diamond was worn was in 1957 at the Tiffany Ball held in Newport, Rhode Island, when the chairwoman of the ball, Mrs. Sheldon Whitehouse, had the honor of wearing it, mounted for the occasion in a necklace of white diamonds. In 1971 the Tiffany Yellow returned to South Africa for the exhibition which marked the centennial celebrations of the Kimberly Mine. After an absence of forty years from London, Tiffany's re-opened their branch in Old Bond Street in 1986, and displayed the diamond to herald its return. This is the best glimpse of the stone's pavilion I've seen yet in a photograph. My replica of the Tiffany Yellow, from the now-defunct NW Diamonds & Gems, which was based in Washington state. The stone measures 28.11 × 28.23 × 15.51. The company dealt in CZ, colored and colorless, in various sizes, large in particular. My Jonker replica was also from the company. I bought my Porter Rhodes replica, from them as well. 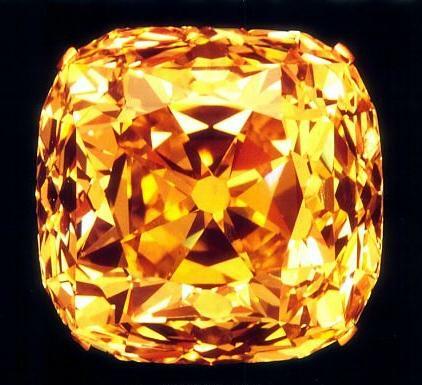 The golden-yellow Tiffany is not only a typical Stellar Cut Brilliant with a star-like arrangement of small facets around the culet, but the crown is stepped, which consequently involves splitting the main facets. This was a standard procedure. * The pavilion, however, received three steps: between the regular two steps a third was applied, which was probably unique. This involved the splitting of the lower main facets into two triangular and one flat keystone-shaped facet. Consequently the Tiffany Yellow Diamond recieved 40 actual facets on the crown and 48 on the pavilion, plus the compulsary table and culet - in all, 90 facets compared with the 56 plus two facets of the Standard Brilliant Cut. No one has ever explained why such a bulky step cut was applied to this diamond. It seems that priority was given to weight retention, since the prestige of a diamond depended at that time primarily on its weight. Dr. Kunz state "that this unprecedented number of facets was given the stone not to make it more brilliant, but less brilliant. The stone was of yellow colour, and it was thought better to give it the effect of a smothered, smoldering fire than one of flashing radiance. 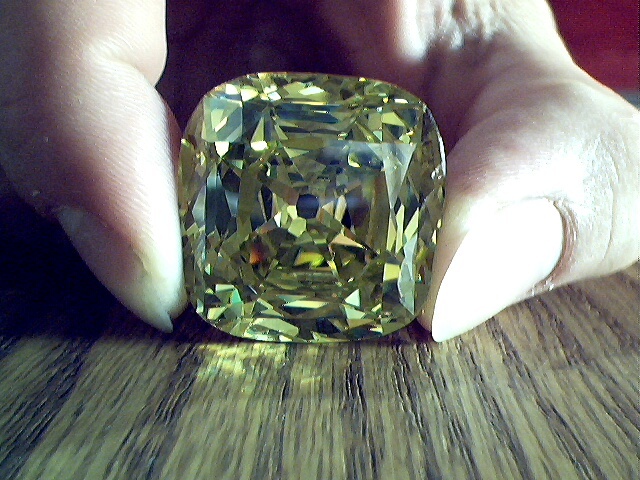 "** The stone has an unusual feature, in a yellow diamond, of retaining its color by artificial light. *** The designers decided to ignore the modern rules of proportioning (such as those introduced to America by Morse) since these would have produced a Brilliant of well below the magic figure of 100 carats, which entitles a diamond to the name of 'Paragon'. Here, even the classic proportions would not have done -- a Brilliant with the width and length of this stone (27 mm × 28.25 mm) with 45° angles would have barely weighed 100 carats. look identical to the ones in Bauer's, but enlarged cleaned up to show better detail. The convex silhouette shows not only the weight saved through stepping but also an exceptionally high crown and deep pavilion. Other measures were taken in order to produce desired light effects. An exact calculation was made of the angles of reflection and refraction of light and the culet was given a size which made it act as a reflector. 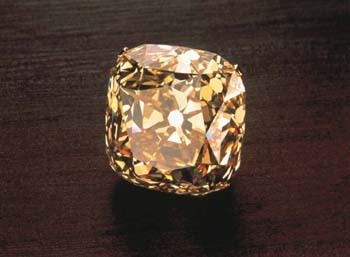 Until the Tiffany Yellow Diamond is professionally examined two queries remain unsolved: the four extra facets on the pavilion, adjacent to the girdle, and the often-mentioned seventeen polished spots on the girdle which, according to a check-up at the premises of Tiffany in 1945, are 'no true facets'. *Another famous but quite different stepped Brilliant is the Saxon White in the Grünes Gewölbe in Dresden. For a detailed description see Herbert Tillander, Journal of Gemmology (UK), July, 1968. **George F. Kunz, Science, August 5th, 1887. ***Gems & Gemology, Summer, 1945. ****According to Tom R. Barbour, in Lapidary Journal, March, 1963, page 1131, the overall depth is 78 percent. *****The cost price, according to Ian Balfour (1987) [mentioned above], was US $18,000. It should be noted that at some time, the clarity of VS1 has been mentioned for the Tiffany Yellow. This, however, might have been an educated guess by a Tiffany official rather than an actual clarity grade issued by a gemological lab. When Tom R. Barbour published his instructions in the March, 1963 issue of Lapidary Journal on how to cut a Tiffany Yellow replica, he called for a 27 mm x 27 mm x 21 mm finished stone. His measurements as well as his facet design were relatively close, at least compared to some of his other replicas. 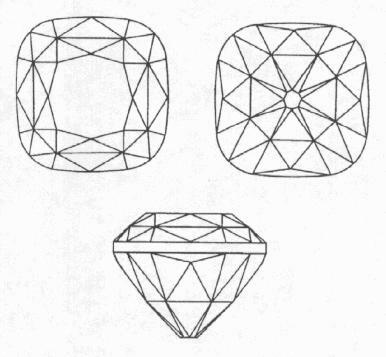 The diamond's design is sometimes shown as having an extremely thick girdle -- as is the case with Herbert Tillander's 1995 book. This was, however, dispelled when numerous photos of the diamond, set in its famous Bird on the Rock brooch, taken from various angles appeared on the internet, taken while it was on display at the Smithsonian Institute in 2007.